There’s a lexicon to dressage. Connection, suspension, swing: These are words that have a very specific horsey, and dressage-y, context that we dressage trainers throw around and make it sound like we’re speaking Swahili, such that a layman might not grasp our meaning. And coming to an understanding of those terms, from the beginning of one’s riding career to the point of mastery, takes a long time, a lot of feel and even a constant evolution. 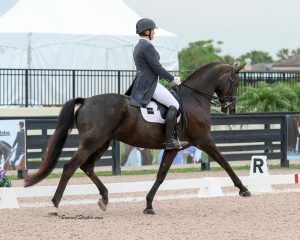 One of my students just yesterday said to me, basically, “Oh my gosh, I thought I understood what you meant by sit down and put your leg on, but it’s so much more than I’d thought!” She’s a lifelong rider, now right on the brink of Grand Prix. We never finish learning Swahili. But one of the biggest and most important concepts to grasp is that of being “on the bit.” Doesn’t that just mean pulling my horse’s head down? Funnily enough, it’s a little more complicated than that. I don’t think I can nail it, perfectly and succinctly, in one blog. But if you all will allow, let me wax philosophical (because it’s what dressage trainers do) about this oft-used but ill-understood basic tenant of the dressage horse.